The community center in Maryland Heights, Missouri employed a translucent wall system to reduce unsightly views, glare, heat, and noise without compromising the amount of daylight in the building. The City of Maryland Heights, Missouri, transformed their original community center, a converted church from the 1970s, with a translucent wall system to meet the building’s needs. 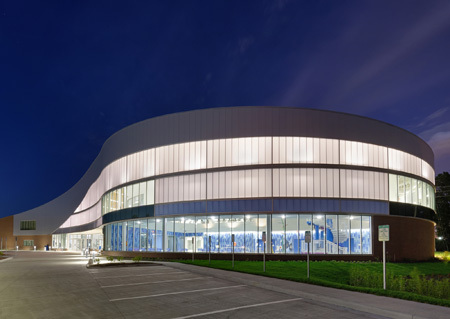 A variety of design goals were specified for the new center, from blocking unsightly views and reducing noise, to finding a translucent façade for the building’s curved and tapered walls. A challenge for the project’s façade was that it required a product that could facilitate the design goals of the building without compromising the amount of daylight in the structure. The center was particularly concerned with noise levels around the facility. Hence, the project team chose a two-panel, translucent wall system with sound-reduction capabilities. The neighboring highway was unsightly to members, so it was important for the community center to control the view from inside the facility. CannonDesign incorporated clear glass into the façade of the 8361-m² (90,000-sf) center in conjunction with 862 m² (9284 sf) of two panels translucent wall systems, specified in clear over white matte colors, to provide the appropriate view. Another component of the center’s design was that the city wanted the facility to have a real presence in the community. Early in the design process, the city challenged CannonDesign to design a building that could be seen as a city landmark from all angles, even at night. To achieve this request, the building was designed to offer a similar aesthetic between the translucent system and metal panels during the day. While at night the facade is transformed by a glowing ribbon of translucent panels as they are backlit by the interior lighting. The resulting aesthetic is noticeably unique, and helps to establish the large presence within the community that the City of Maryland Heights was looking to accomplish. “The new community center has become a source of pride for the community and exceeded Maryland Heights’ goals for memberships and program participation,” said Schenck. The community center earned CannonDesign a 2017 honor award from the St.Louis Chapter of the American Institute of Architecture (AIA).